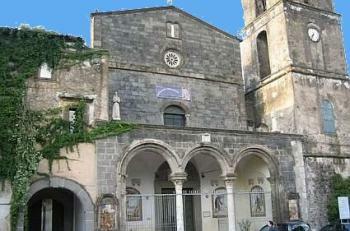 (Apr13) Restoration of the church of Portosalvo has finally started. It's hard to tell how the work is going because they have draped safety screens over all the scaffolding, which is normal. Also relatively normal is the fact that they are going to pay for the restoration by selling ads on the screen. Big ads. (See this link.) That is of some concern, since, after all, it's a church and blah blah blah. I've noticed a giant ad for Original Marines, a shop that sells men's clothing and sporting goods. So far, nothing offensive. (Apr14) This is just like Bingo Night at St. Mary’s except it’s for a good cause! The Polish monks who run the church of Santa Maria del Pozzo di Somma Vesuviana (photo, right), near Naples, held a raffle to raise 70,000 euros so they can at least start on the restoration of the church, a historic gem that dates back to 1510 (and even that was built on an earlier Angevin house of worship). One of the monks was a bit apologetic about trying to sell 8,000 tickets to the faithful, one of whom will win a car. That's gambling! "Times are tough," he said. (Apr16) Brandi is the best-known restaurant/pizzeria in Naples. It has sat just off of via Chiaia for 300 years, when it was called Pietro...e basta così. Its major claim to fame is as the inventor of the Pizza Margherita, the genial idea of one pizza chef named Raffaele Esposito, who in 1889 sent a pizza to Queen Margherita at the royal palace (200 yards away. “Sorry, your majesty. We don’t deliver.” !? No, I don’t think so.) with the red, white and green trimmings of the (then) new Italian flag. The restaurant is decorated with photos of the fat & famous, throwing back enormous three-hour multi-course Italian meals. They may have started with pizza as an appetizer, but they then wound their way through pasta, fish or meat, cheese, dessert and resuscitation heart paddles. The photos and nostalgic decor will no doubt remain, but all you will now be able to order up is pizza—and, ok, maybe a few pizza side orders such as insalata caprese. The owner claims that this has nothing to do with economic difficulties. It’s what people want, he says. The establishment is dead in the center of Tourist Naples, and when the Japanese, Americans, and ten-foot-tall blue-skinned Na’vi tourists show up this summer, all they’ll be able to get is pizza. Not just Margherita, mind you. There’ll be a lot of choices. (May 5) I’ll take one of those...and one of those...and... It's early May and the isle of Capri is awash with wealthy house hunters. 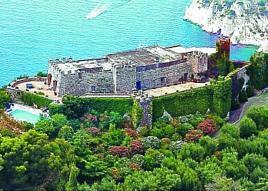 There are, in fact, 30 exclusive villas for sale on Capri. There’s a nice little number down by the Faraglioni: two level home, three bedrooms, terrace, two baths, studio, kitchen—all for the low, low price of €4,950,000 (that’s just so you don’t scream “FIVE MILLION EUROS! ?”) At the other end of the list, we have the famous Villa Castiglione (photo, right); it’s on a hill at 250 meters above sea-level, built on the ruins of one of Tiberius 12 imperial residences, and has never been subdivided into apartments. You get the whole thing. It’s spectacular. The current owner wants out. It’s yours for €35,000,000. Don’t try to bargain with them. If you can’t meet that price, they’ll find someone who can. Easily. (May 29) Italy's grand Tremonti Recovery/Austerity Plan to save the Italian economy includes such things as cutting the salaries of politicians (good! ), fighting tax evasion (hah!) and a broad series of budget cuts to regional governments, such as Campania, of which Naples is the capital. Cuts seem to hit culture first. (See the San Carlo item, above). Now, word comes of cuts to the following: the Anton Dohrn Aquarium (photo, right), the Benedetto Croce Library, the Center for the Study of the Herculaneum Papyri, the Marine Park on the isle of Vivara (Procida), among others. Some may be closed, and some may simply wind up with so little money that they can't function. Some, such as the aquarium, though scheduled to be closed, will wind up incorporated into the university. No one knows what that means. (May 31) This news will not warm the cockles of your spaghetti ai frutti di mare. Most Neapolitans like a few marine bivalve molluscs in their spaghetti or Pantagruelian soups once in a while. The favorite two of these little "sea fruits" are the tellina and the cannolicchio—respectively, the cockle and the European razor clam. Well, there is trouble in clam city thanks to new European Union (EU) fishing regulations that regulate how close in to shore you may spread your net upon the waters. The new and greater distance, though obviously meant to prevent overfishing and depletion of the creatures, will cause great difficulty in trying to meet local needs. 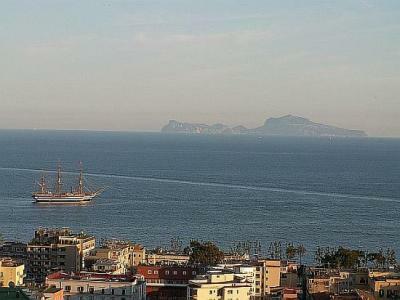 (June 10) Yesterday was Italian Navy Day, and it was celebrated for the first time in five years in the Bay of Naples. The centerpiece was the presence of the "tall ship," the Amerigo Vespucci, a training vessel built after the design of large, late-18th-century ships of the line. The vessel is a full-rigged three-master with an overall length of 101 meters (331 ft) including the bowsprit. The ship was built in nearby Castellammare and launched in 1931. It is one of many sailing vessels used to train young seamen in navies throughout the world. In the summer months, the compliment of 223 officers and men is augmented by 140 first-year students from the Italian Naval Academy in Livorno. The Amerigo Vespucci was meticulously overhauled in 2006. (Also see Boats of the Bay. )(Also see this entry on the ill-fated sister-ship, the Cristofero Colombo.) Both vessels were modeled on the old Bourbon flagship, the Monarch (see this link). (June 12) The Oscar Niemeyer boondoggle auditorium in Ravello took ten years to build, had a glorious opening, has not been used a day since the opening in February and is now in such run-down condition that it will not host any of the events for this summer's Ravello Festival and will not even be available to musical groups as rehearsal space. Since the European Union kicked in 18 million euros for this baby, a lot of folks are screaming mad. It seems to be the fault of petty politics: the party that was for it was in and is out; the party against it was out and is in. That's the theme; supply your own variations. So, there it sits. It still looks pretty good in architecture magazines, though.